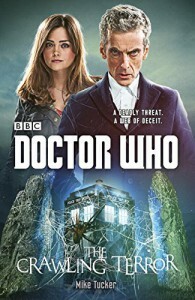 I anticipation of the new Doctor Who series (where we'll finally get to know the new Doctor) I'm reading/reviewing a few of the new Doctor Who Books. If you want to catch up, you can read my reviews for Touched by an Angel (Weeping Angels) and The Engines of War ("Ex-ter-mi-nate! "), featuring my two favourite Doctor who monsters. The Crawling Terror is a new kind of book for me on a number of levels, for it is the first Doctor who novel I've read that featured either Clara (I don't like her), the 12th Doctor, or adversaries that are not already iconic, like the Daleks for example. Do you like insects? And spiders? Then you're just going to love this story, as some massive insects and spiders feature in it. Giant spiders are nothing new of course (think for example Harry Potter, or Middle Earth) but they never fail to freak people out. I, myself was scared by the thought of giant mosquitoes, as I always try to stay away from even the little ones. The TARDIS brings Clara and the new Doctor to a little village in England, under attack by said insects and arachnids. It looks like the local science park might be responsible, but just what has it all to do with an alien species and a military experiment completely gone wrong? The story started quite creepy actually, something I don't always experience in Doctor Who. There was a rising tension as the villagers tried to run from the attack. The second half or so of the story is more bizarre as everything (well, almost everything, but no Daleks) gets thrown into the plot, like Nazis, time travel and aliens. What's a good story without them? It didn't always feel like this was a different Doctor during the novel. This is most likely due to the fact we've only seen so few of him, that I wouldn't know how to describe him except that he's older than the last few Doctors. I'm sure this will all be solved after the new series starts. I still don't like Clara, but that's not the fault of the book. Overall, it was an enjoyable read, but perhaps a bit too bizarre for me at times. It still read as an episode from the series, which I think is precisely what one wants when reading these books. For my little Doctor Who project I've got two more books that will be read in the coming week(s): The Blood Cell and Silhouette.